Last fourth of July, just a few hours before the sun began to rise across the Baghdad skyline, the distinct sound of gunfire could be heard. In a street in the war-weary metropolis, several vehicles containing armed men pulled up outside the house of Abd-al hussein Saddam, head of the Safety Forces of the Iraq Freedom Congress (IFC). The house was promptly saturated with bullets, some of which found their mark in the body of Saddam’s eighteen-year-old daughter as the troops attempted to gain entry to the residence. Leaving the young woman bleeding on the floor, the soldiers apprehended the IFC leader — who himself had been shot — and promptly bundled him into a waiting vehicle. Two days later his badly beaten and lifeless body was dumped at the Yarmouk Hospital. Such incidents have become commonplace in a nation that has suffered decades of dictatorship and now four long years of foreign occupation. Poverty, fear, and the rule of the gun have all risen up to command centre stage in Iraq. One of the most profound humanitarian and political tragedies of the 21st century is unfolding. What is notable about much of the media coverage of Iraq is its lack of analysis of the varying political factions either opposed to or in favour of the western occupation. Aside from the myriad nationalist and fundamentalist factions, there are also those opposed to both the occupation forces and political Islamists in equal measure. These secular and republican activists have been overlooked, no doubt because news stories about fire fights and explosions stand a better chance of making the headlines than stories about oil workers protesting against a foreign monopoly, or women’s rights activists refusing to cover up at the demand of armed Islamists. The Iraq Freedom Congress is one such group that has been sidelined. Founded in 2005, the IFC has struggled to survive amidst the fluid and potentially lethal currents of Iraqi politics. Suffering under the hostile eye of both the government and occupation forces, and those making up the sectarian militias, the organisation has none the less become something of a rallying point for progressive forces. Made up of trade unionists, political activists, women’s rights advocates and other groups, they have managed to gain significant influence in a number of areas across the nation. As staunch advocates of secularism and fierce opponents of division, they rally around the slogan "No Shiite… No Sunni… ours is a human identity." The IFC is organised into units known as 'People's Houses', which operate under a mandate of popular sovereignty in local areas. Officials are chosen directly from local communities. 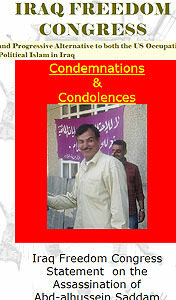 Abd-al hussein Saddam is widely believed to have been murdered because of the growing strength of the IFC. As head of the Safety Forces, his job was to coordinate the deployment of IFC police forces — made up of both Sunni and Shia — who protect their neighborhoods from the escalating violence in Iraq. 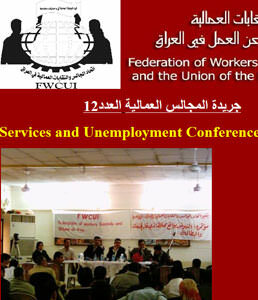 Although a young organisation, the Safety Forces are now a regular sight in several Baghdad neighborhoods, The IFC has its primary base of support within the Iraqi trade union movement, including the Federation of Workers Councils and Unions in Iraq (FWCUI) and the Iraqi Federation of Oil Unions (IFOU). Because of this prominent role in the labor movement, the IFC has found itself in the limelight recently, due to its opposition to a proposed law that will open up Iraq’s oil fields to foreign exploitation. At presentr, the Iraqi parliament is considering ratifying measures which will effectively grant the majority share of the oil fields to several notable western oil conglomerates, such as Exxon Mobile and British BP Amoco. But opponents of these laws are having a hard time being heard in an environment where violence is often the preferred means of settling disagreements. The bulk of the trade unions are currently not recognised or legally approved of by the Iraqi government, which has stifled the ability of the IFC to organise in the industrial field. As a part of the wider movement for democracy, republicanism and independence, the IFC deserves the support — and wide scale recognition — of the progressive movement worldwide. In the final analysis, the Iraq situation is a lot more complex than a simple stand-off between western democracy and political Islam. Until this is understood, a viable solution that takes Iraq towards genuine democracy and self-government will be impossible. Recent articles by Dan Read. The Prime Minister's decision to take over funding of Devonport's Mersey Hospital seems to fly in the face of rational analysis of service delivery capacity of the area. It does not set a promising precedent for the health planning prowess on the part of the Commonwealth.